The Sengwer people, a traditional hunter-gatherer society estimated to have a population of only 15,000, have inhabited the forest area for hundreds of years and regard the Embobut forest area as their ancestral home. International human rights organisations are condemning the Kenyan government for undermining the tribe’s constitutional entitlement to free, prior and informed consent to the evictions and for illegally breaking international agreements on conservation and human rights. “Crucially, the constitution states that ancestral land and the land occupied by traditionally hunter-gatherer groups such as the Sengwer is ‘community land’ owned by that community. None of these legal provisions are being respected by the government of Kenya in the recent evictions of the Sengwer from Embobut forest,” Tom Lomax, a legal expert with the Forest Peoples Programme, an international NGO that promotes forest peoples’ rights, told IPS. Despite the government declaring conservation as its reason for the community’s eviction, its actions break official commitments to the United Nations Convention on Biological Diversity (CBD), which require the state to protect and preserve traditional communities and their adaptive practices that have helped maintain the forest area. Lomax maintains that the conservation of biodiversity or ecosystems in compliance with CBD commitments cannot justify evictions of indigenous communities by armed troops and the burning of houses. “These evictions are unlawful under Kenya’s constitution and under its international legal commitments. The strong connection of the Sengwer to the Cherangany Hills forests [where the Embobut forest lies] means that their very physical and cultural survival as a people is at stake in these evictions,” Lomax said. “It is through such actions that whole cultures, languages and histories die. Sengwer ancestors are buried in Embobut forest, and their sacred places and livelihoods are there. They have nowhere else to go,” he added. “The reason of telling people to move out of the forest was meant to conserve one of the Kenya’s water towers and no one is being forced out but are moving willingly,” he said in the statement. Over the last 20 years regional landslides and election violence have created a large number of Internally Displaced Persons who have inundated the Embobut forest in the Cherangani Hills. The Sengwer community have found themselves conflated with the settlers and labelled as “squatters” by the government despite an injunction secured at the High Court in Eldoret forbidding evictions until the issue of community rights to their land is settled. The Kenyan government has pledged 400,000 shillings (about 4,600 dollars) as compensation to each evicted family. However, the Sengwer community have refused to take money in exchange for their land and burnt possessions. The World Bank (WB) is being investigated by its own inspection panel after the Sengwer community complained in January 2013 that the WB-funded Natural Resource Management Project was responsible for redrawing the borders of the Cherangani forest reserves. This redrawing of the borders led to the Kenyan government evicting, without consultation, community members found on the inside of the forest reserve. The government has invoked the WB redrawn boundaries to legitimise forced evictions from 2007 to 2011 and in 2013. “While the main culprit here is the Kenyan government, the World Bank must also be held accountable. It financed a project that redrew the boundaries of the forest reserve without consulting the Sengwer,” Freddie Weyman, Africa campaigner at Survival International, told IPS. “Some families therefore suddenly found themselves living inside the reserve and subject to eviction. 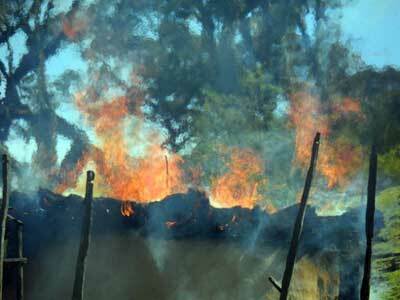 This is now the seventh time authorities have torched houses in Embobut in the seven years since the project began. Can the World Bank guarantee that its loan did not facilitate these evictions?” Weyman asked. International conservationists reject the Kenyan government’s stance that a traditional hunter-gatherer lifestyle is incompatible with the goals of conservation and forest protection. Instead, they say, environmental conservation is best achieved by supporting indigenous communities who have experience of preserving their habitat and resources. Liz Alden Wily, research fellow at the Rights and Resources Institute, told IPS that this is a “battle between conservation and particularly the colonial inherited mode of fortress conservation where everybody has to be removed for the forest to become pristine, to modern approaches which utilise occupying communities as the conservators. “Around Africa and the world, the latter strategy is beginning to get a grip,” she said. “These areas are the residue left of their ancient territories. [The] Ogiek, Aakuu, or Sengwer, are people who live essentially by forest hunting, honey gathering [some have 80 hives], and some small numbers of livestock and small farms. They have a different commitment to the forest. Consider, for example an Ogiek honey gatherer, dependent on his hives. Would he burn the forest or clear the forest and lose his livelihood?” Wily said. Since the 1970s Kenyan authorities have made repeated efforts to forcibly evict the Sengwer from the forest for resettlement in other areas. The “Fortress Conservation” approach that involves evicting indigenous communities rather than consulting and supporting them is increasingly discredited as counterproductive. Instead, the ‘New Conservation Paradigm’ promotes an approach to conservation that supports ancestral communities to continue protecting their forests and biodiversity. “Rather than returning the area to ‘pristine’ forest, it actually does just the opposite as profit-making plantations and agriculture replace the biodiversity of the indigenous forest. Far from protecting ‘pristine’ forest, this approach uses ‘conservation’ as its excuse to first evict the indigenous inhabitants before destroying the indigenous forest,” Justin Kenrick from Forest Peoples Programme told IPS.